The Unit of Paediatric Dentistry accepts referrals for children under the age of 16 years. Children with complex medical problems which may affect the provision of dental care. Children with developmental problems, learning difficulties and behavioural problems, who are unable to cooperate for routine dentistry. Children with congenital or acquired dental anomalies who may require complex restorative or orthodontic treatment (e.g. Hypodontia, Ameologensis Imperfecta, Dentinogenesis Imperfecta, Molar Incisor Hypominerisation, Micro/macro-dontia and delayed eruption). Children with soft or hard tissue pathology such as ulceration, swellings, and cysts. Supernumeraries, odontomes, impacted teeth, submerging teeth, abnormal frenal attachments, and tongue-ties which may require surgical management. Pre-cooperative children who require extractions. 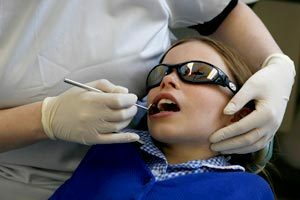 Children with extreme dental anxiety who have proven unable to co-operate with routine dental treatment. Recent treatment attempted (e.g. failed extraction under local anesthesia). “Clear justification for the use of General Anaesthesia , together with details of the relevant medical and dental histories, must be contained in the referral letter”. The Department provides an Emergency service only for children with acute pain, infection, bleeding or acute dentoalveolar injury. This service operates weekday mornings only (except public holidays) and patients should be advised to arrive between 8:30 to 9:00 am, as the service works on first come, first served basis. Each case is assessed for urgency and prioritized by a triage nurse. Extreme cases (i.e. severe extra oral swellings, avulsed or severely displaced teeth may be referred via telephone call to the Department on 0161 275 6707. Inappropriate/ inadequate referrals will be returned. Your compliance with the above guidelines will avoid unnecessary delays in patient care. Thank You. Whenever possible please use the referral form available.